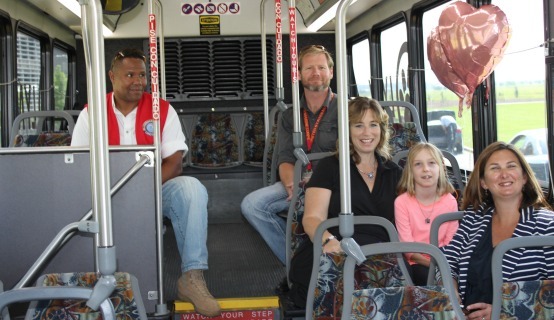 Orange County District 4 Commissioner Jennifer Thompson recently took a ceremonial ride with Nemours patient Sadie Veselka, her mother Dawn Veselka, and two veterans who rely on LYNX to get to the Department of Veterans Affairs Hospital. Commissioner Thompson decided to ride the line to make sure citizens were aware of Fast Link 418, which launched late last month to and from Lake Nona Medical City. Commissioner Thompson and her special guests boarded the bus at Nemours Children’s Hospital. Dawn Veselka, mother of Sadie said that while she does not rely on public transportation, she knows many other families do need the service. Commissioner Thompson was also joined by veterans Daniel Cool and Ricardo Warren, who are currently receiving treatment at the VA Hospital in Lake Nona. Both veterans shared with riders how the new route has provided them with an opportunity to reconnect with the outside world. Cool shared how he intends to use the service to get to and from his new job. Both intend to use the new service to connect with SunRail and as an opportunity to acclimate back into civilian life. Commissioner Thompson worked for two years with LYNX and the state of Florida to secure funding for this route, which launched on April 14. The new bus line makes stops at the Florida Mall, Sandlake Road SunRail Station, Taft Community Center, Cypress Creek High School, Nemours, the UCF College of Medicine and the Department of Veterans Affairs Hospital.